This is a Flickr badge showing public photos from Ms. Holly. Make your own badge here. I was honored with the Arte y Pico award from Senja of Imagine Knit. Thank you, Senja! Senja lives in my neighborhood and is a fellow Knitter, Blogger (and Finlander). If you get a chance, check out her blog. 1.) Show the award. Link back to the blog that gave you the award. 2) Pick 5 blogs that you consider deserving of this award because of creativity, design, interesting material, and contributions to the blogger community, no matter of language, and link to them. 3) Leave comments on the blogs to let them know you've given them an award. 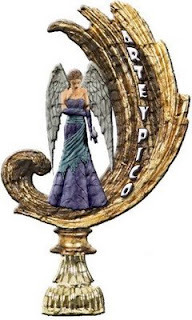 4) Show the link to the Arte y Pico blog , so everyone will know the origin of this award. Yarnit- Lara has many gorgeous finished knitted objects and is an inspiration to me. She's also a hardworking mom and nursing student. Plus, her very young daughter is just learning to knit! Northwoods Baby-Miranda is a hoot to meet up with at the LYS. A fabulous knitter, and another hardworking mom and nursing student full of sassitude. Her blog is hilarious. She also has great recipes! 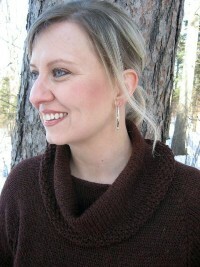 Fig and Plum- Jess's blog is one of the first knitting blogs I ever started reading. Her knitting projects are enviable at the very least. She's also a foodie and has wonderful recipes and magazine worthy food pictures. She is full of the Newyorkness that I find so chic. The Heathen Housewife- I had the honor of meeting Shelly at the Shepherd's Harvest Sheep and Wool Festival this spring. She has a wonderful pattern for a sock yarn blanket. It is pictured on the banner of her blog. Stricken- I just recently found this blog. Jordan is a young college student who designed one of the most gorgeous sweaters I've ever seen, it's called Lyric Tree. She also plays the viola. I think my Hourglass sweater has been on the needles for close to a year and finally it's done. I still need to block it. The collar is very wide, it could have used a few extra rows I think. Hopefully the blocking process will make the collar a little less saggy. I'm close to being done with Koolhaas (it's a hat, for those of you who are not familiar). This has also been on the needles for close to a year. I made a pretty major mistake in the middle. The pattern jogs back and forth a stitch every few rows and I totally confused the "back" with the "forth" once. Am I going to rip back? Absolutely not. Off topic: I don't usually blog about vehicles, but, I caved and bought a new one. It's a Jeep. It'll dash through the snow. And dearies, the snow is not far away. I haven't had a vehicle payment in like eight years, so...well....you know. My parents just bought an RV. It's KICKA$$. I wish I had a picture to share. I was thinking if there ever were a prime time to move back home with Mom and Dad, it would be right about now. I'm envisioning a roadtrip to Rhinebeck. Just think of all the storage space for yarn! Zoom Zoom! !